SARA EISEN: So, thank you so much for speaking to me again. We're here at the IMF meetings where everybody's talking about slower global growth. What's the outlook for Japan right now? SARA EISEN: You see it turning, though. SARA EISEN: And that he'll help Japan? HARUHIKO KURODA: That's right. Yeah. HARUHIKO KURODA: Yeah, yeah. Yeah. HARUHIKO KURODA: Two factors. 1) Despite the very good corporate profit levels and also despite a very strong labor market situation, I mean, unemployment rate is only 2.3%, which is even in Japanese context, full employment. And yet, wages are rising somewhat moderately, modestly. That is one factor. Another factor is in the last five, six years labor productivity increase in Japan was the highest among G7 country. Higher than United States, higher than in Germany. So, wage costs certainly rose. But because of labor productivity increase, corporations can manage, without raising the prices. So, wages are rising, but moderately or modestly. Prices are not rising much because of huge labor productivity increase. So, at this stage, headline inflation rate is 1% or slightly less than 1%. And if you exclude energy items, then inflation rate, whole inflation rate is only about 0.4% or 0.5%. SARA EISEN: So, what do you do? What do you do about that? You've done everything. HARUHIKO KURODA: Yeah. Everything. And also, as I said, the economy's doing quite well. The corporate sector enjoys historic high-level profit. Better than they enjoyed during the bubble period in late '80s. And the labor market is quite tight. Probably the tightest in the last 30, 40 years. So, the economy, real economy is doing quite well. But, as I said, wages are not rising so fast as we hoped. SARA EISEN: So, do you feel you have to do more? HARUHIKO KURODA: I yeah. Yeah. I think, even so, I think the wages are now rising and accelerating. So, by maintaining current extremely accommodative monetary policy, the labor market continues to be tight. And output gap, at this stage, output gap is not negative. It's now even positive. So, by maintaining extremely accommodative monetary policy, maintaining a tight labor market-- we are reasonably sure that wages accelerate and prices also accelerate. SARA EISEN: I did see that Amazon is raising prices in Japan for the first time since it's been there. That must be some sort of good sign for you. Did you see that? HARUHIKO KURODA: --six years. And yet, of course, when we introduced that monetary policy, the inflation rate was -0.5%. It's now at 1%. SARA EISEN: So, it's worked? SARA EISEN: Yeah. I mean, it raises the question though, that if we do, global economy face a steeper decline, or downturn, or even recession whether central banks, especially yours, has the policy ammunition to fight it. HARUHIKO KURODA: Yeah, yeah. Of course, since our policy rate is -0.1% and the ten-year JGB rate is around 0%. But still, we can further reduce interest rates. SARA EISEN: How negative can you go? SARA EISEN: If you need it. HARUHIKO KURODA: Yeah, if needed. But at this stage, we don't think it's necessary. HARUHIKO KURODA: Yeah. Yeah. Yeah. SARA EISEN: --accommodation for so long? HARUHIKO KURODA: I think a major side effect is its impact on the profitability of the banking sector. Because banks can make profit through the interest rate gap. SARA EISEN: It's crushing them. HARUHIKO KURODA: Yeah. It's almost-- almost-- nothing. SARA EISEN: To deal with it. HARUHIKO KURODA: That's right. But so far, it's okay. And even local banks have enough capital so that even if their profit becomes negative, they can sustain for several years. But, as I said, eventually they have to create some sort of restructuring. SARA EISEN: Are you surprised at the value of the dollar-yen given how much easing you've done relative to the Fed's normalization and where the ten-year yield is versus the U.S. ten-year yield? SARA EISEN: I mean, the Japanese yen hasn't weakened that substantially. SARA EISEN: So, you're satisfied? HARUHIKO KURODA: Yeah, yeah. So-- and also, as you know, exchange rates are affected by many factors. Not just bilateral interest rate differential, but many factors. SARA EISEN: Yes, when the trade war gets worse, the I mean, it-- it affects the dollar-yen. HARUHIKO KURODA: At this stage, I don't know. Trade conflict is between U.S. and China. And I hope trade conflict be-- solved, relatively soon. I hope. I don't know. SARA EISEN: How much do you think it's hurting the global economy? SARA EISEN: But it's affecting the outlook. I mean, actually Japan is going to start trade talks with the U.S. next week. SARA EISEN: Do you see this as a potential risk factor if our administration pursues the path of tariffs or tariff threats? SARA EISEN: Have you looked at a scenario where if the U.S. put tariffs on Japanese car exports to the United States, what would that do the Japanese economy? SARA EISEN: $60 billion. The President still wants to eliminate it. Is that possible? 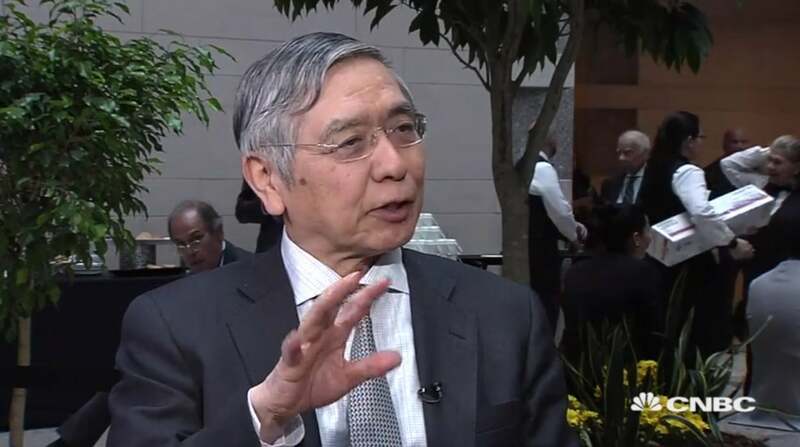 HARUHIKO KURODA: --will be quite important. But it should be global multilateral and not only trade balance but service-trade balance, income account balance, and so on, so forth. So, I think for any economy, important-- variable is not bilateral trade figure but global current account figure. And the-- from this point of view, I think U.S. has been managing its economy quite well. Of course, some current account-- deficit. But quite manageable. And this shows that the U.S.is importing capital. And many of them are FDIs. But Japanese companies, European companies come to the U.S., doing business, creating jobs, hugely in the United States. So, I think from this perspective, as you know, the-- the G20 under the Japanese presidency will discuss global balances. How to avoid excessive global imbalances. Not bilateral trade balances. SARA EISEN: Right. Yeah. It's good that you're taking over the conversation I guess this year. So, when you look globally, I mean, risk assets have performed very well in 2019. SARA EISEN: It's been risk on. That's helped the dollar-yen. It's helped a lot, in terms of the economic outlook as well. Do you expect that kind of environment to continue? HARUHIKO KURODA: --accelerate to 3.6%. And this is the main scenario. And it is most likely. If this is realized, I don't think there will be any financial market tumble or anything like that. But this mainline scenario is mainline. HARUHIKO KURODA: There are a lot of-- a lot of downside risks. SARA EISEN: What's the biggest risk to the global economy? SARA EISEN: Governor Kuroda, thank you so much. HARUHIKO KURODA: I enjoyed it. Thank you.